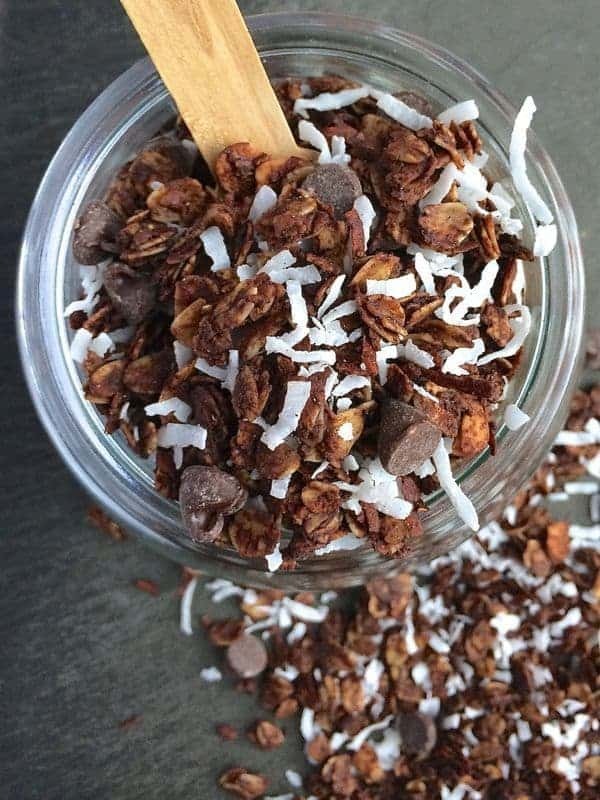 Chocolate, coconut and almonds are lightly sweetened with honey to create this healthy and addictive homemade granola. Shortly after giving birth, I received the most thoughtful care package from my dear friend Aggie, In addition to sending gifts for both of my boys, she also picked out a few items just for me. What a woman!!! One of the items Aggie sent were these new-to-me granola oat clusters from Love Grown Foods. It is so nice to receive food gifts made with quality ingredients I can easily pronounce. 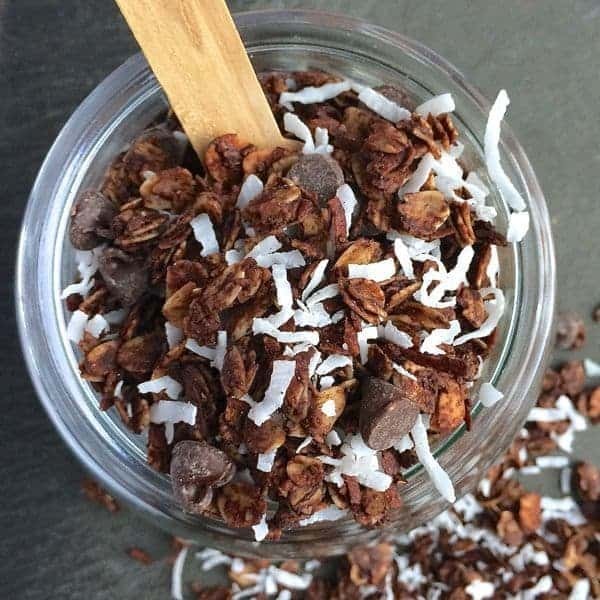 My entire family quickly became addicted to this chocolate granola which is why I decided to create my own version. If you’ve never made homemade granola, I encourage you to give it a try. Mix and match the flavors to make it your own. If you don’t have almonds on hand, swap out walnuts or pecans. Instead of honey, try using pure maple syrup. Coconut oil adds a subtle background flavor but canola or olive oil are great substitutes. Whip up a big batch on the weekend and store it for up to two weeks in an air-tight container. Scoop it out for busy weekday breakfasts or stash it in your car or desk for healthy snacking any time of day. Pre-heat oven to 275 degrees and line baking pan with a silicone baking mat or spray with cooking spray. In a large bowl, toss together oats almonds; set aside. Heat honey, coconut oil, cocoa powder, vanilla and salt in a small sauce pot over medium heat. Whisk constantly until coconut oil melts and mixture is smooth - about 2 minutes. Remove chocolate mixture from the stove and pour over the oats mixture. Using a rubber spatula, stir ingredients until everything is evenly coated with the chocolate mixture. Spread granola evenly on baking sheet and bake for 50 minutes stirring mixture once halfway through the cooking time. Let cool completely before stirring in the shredded coconut and chocolate chips if adding. Can be stored up to 3 weeks in an airtight container. Never knew granola was so easy. Wanna try making it. What kind of Oats did u use? Rolled, steel Cut, Instant? Unfortunately, in India we only get instant oats & I’m not sure if I can use them to make this. Also the temperature is it in Degrees or Fahrenheit? I typically use old fashioned rolled oats for the added texture. You could use instant oats but the cook time might be faster. The oven temp is in Fehrenheit. I hope you try it!! Report back! Yes absolutely – just use canola oil! I was just thinking I need to make another batch! Pinned instantly! I’ve only made granola once before (peanut butter),but this recipe has convinced me to try again. Coconut and cocoa, how can you go wrong? 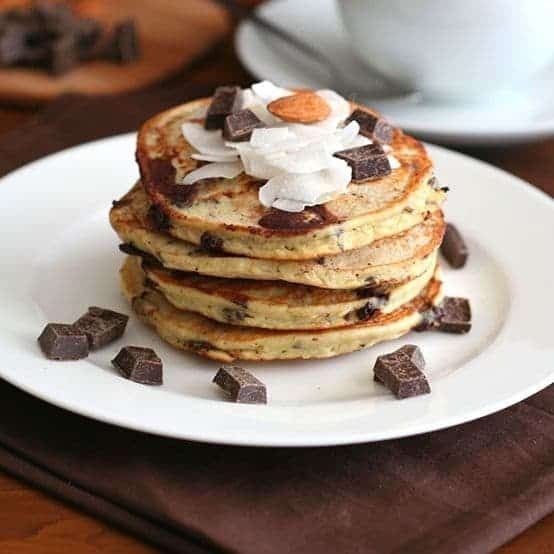 Love the chocolate and coconut combination, perfect! This would be perfect when I’m craving a handful of something sweet in the afternoon! Thanks for sharing! Let me know what you think Whitney! I love them too Annie! This was my compromise. What a fantastic treat! I love taking my favorites and making them at home. I love making homemade granola!! This is such a yummy idea of adding a little chocolate to the mix! This would be a great snack to keep around the house. Almond joy is the best! You know this will be happening soon! It really is Jessica!! I hope you like it! Yummmmdiggity! My favorite flavor combo in granola form… heck yes! 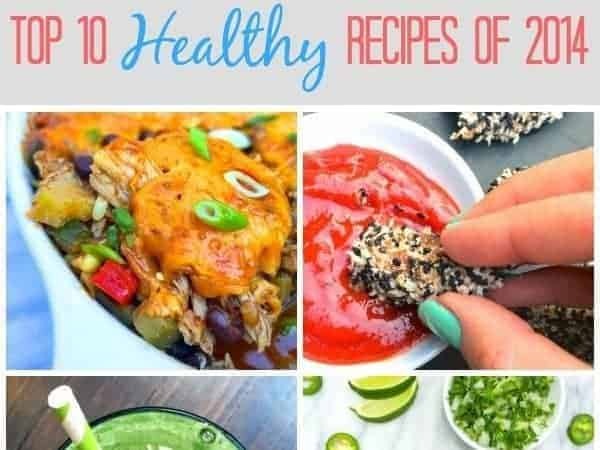 This looks so yummy and we have all the ingredients! 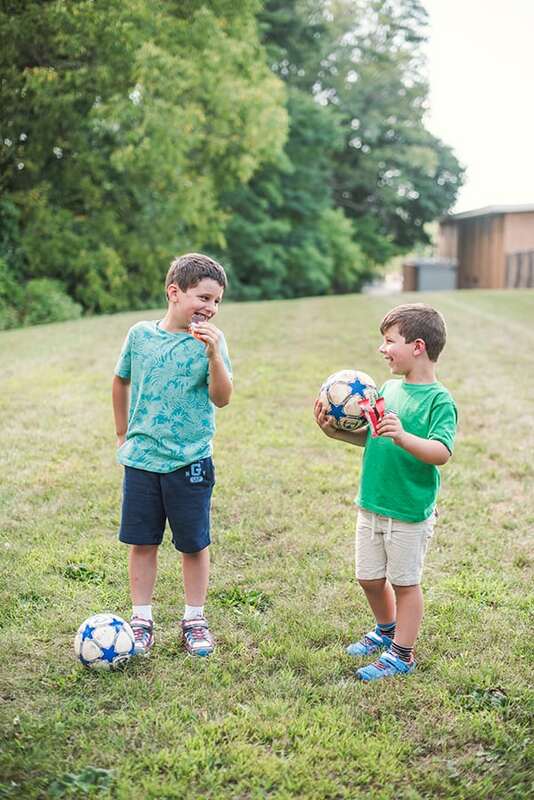 My boys are going to love helping me make it. Did you put it in oatmeal or yogurt, or eat it by itself? I mean, I would totally eat it by the spoonful, but just wanted to see how you ‘used’ it! We ate it on plain Greek yogurt or just on it’s own as a snack. :) I hope you love it! Umm…mine too. Always have to be careful having it around! Aww that is so sweet!! Hmmm and it’s giving me ideas for my friends who are about to give birth any second. I’d have to double the batch of this, though – one for me and one for them! You just hit my weak spot, Liz! I don’t think I have the power to say no to Almond Joys in any form. This granola is amazing! LOL you and me both! Why are they so good?! I’m thinking a batch of this needs to go in my next care package to my son in college. Looks perfect! This would be PERFECT for a care package! Mmmmm I would totally die for a hugh jass bowl of this doused in ice cold almond milk! Heaven. Ok you’re making me drool!! Yes! Oh my goodness, I love love love!!! Love Grown Foods granola. As in, I can barely stop myself from eating the entire bag in one sitting. 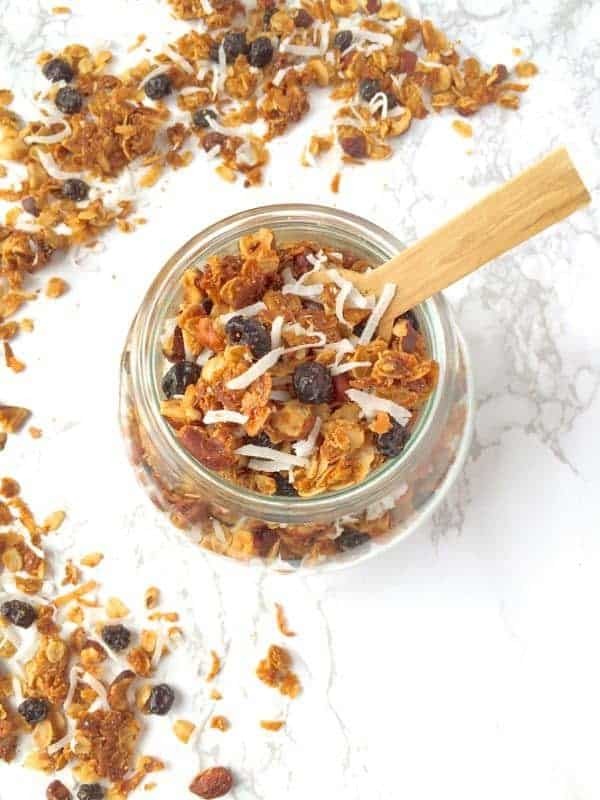 This granola looks so delicious – I’ve never made chocolate granola, but I’m thinking it needs to happen asap! So funny Love Grown was new to me but I’m now a huge fan!!! How sweet of Aggie! So great that you were able to recreate this granola at home – it sounds fantastic! Isn’t she the greatest?? Thanks Jeanette! I love Almond Joy! This granola is calling me! Pinning! You must make it Anna!! Chocolate for breakfast? WHERE’S MY SPOON. Yuuuum!! Almond Joys are my favorite!! They are mine too!! Thank you for inspiring this recipe! It was so tasty and a little really goes a long way! That looks wonderful! I LOVE cereal and granola! 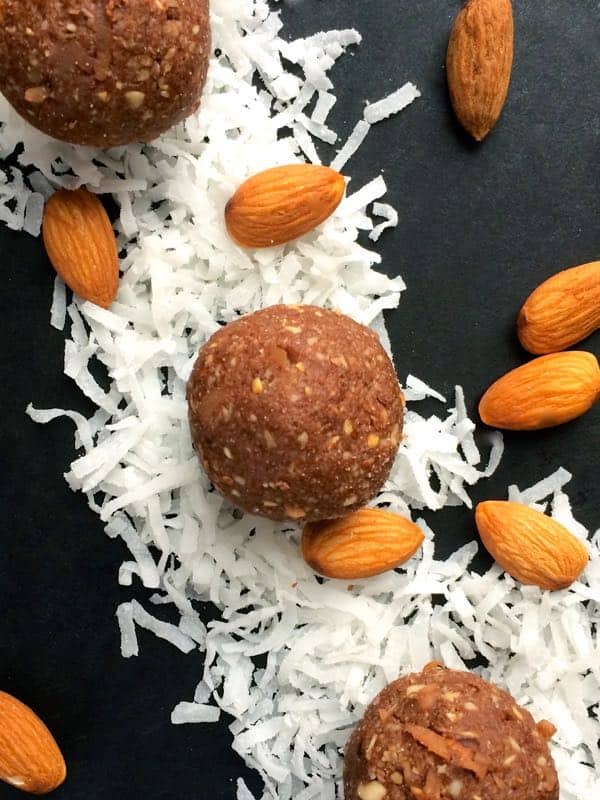 It is my favorite breakfast/snack/anytime food, and I would love to make some of this for afternoon snacks after my second run of the day! I am pinning for a make soon recipe! Thanks for the idea! Yum yum yum! Let me know if you try this Tina!! It was a huge hit! I wish I did too!! We devoured it in 5 seconds.